Metropolicks co-authors, Felicia Lin and Victor Scott Rodriguez have been invited to host SCENEPR! 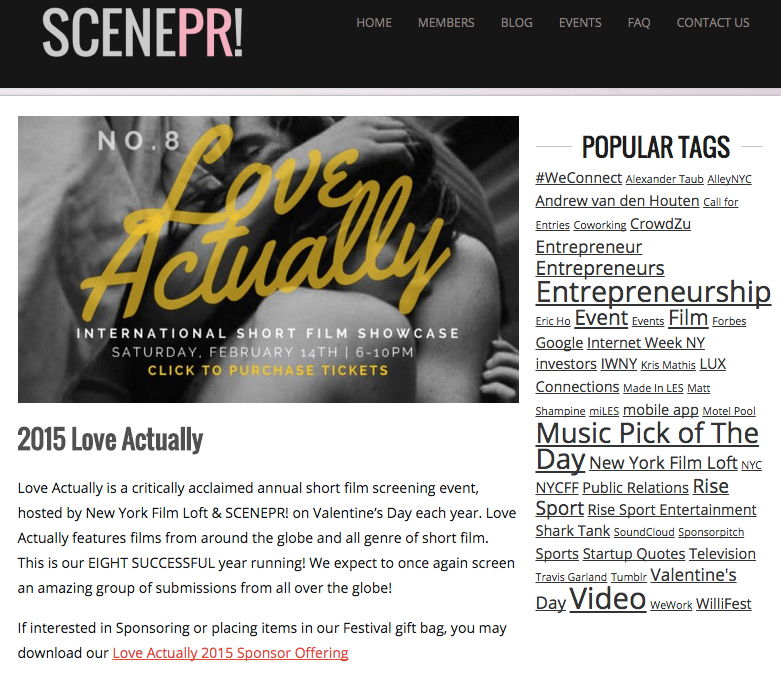 's 8th Annual Love Actually Short Film Showcase on Saturday, February 14, 2015. Whether you're attached, footloose and free or looking for love, if you don't already have plans for Valentine's Day, we hope you'll join us for this fun event! The event will open with a wine and cheese pre-screening mixer from 6:00-6:30pm. There will be an intermission and post-screening networking. 1) TWO NEW Valentine's Day themed Metropolicks videos* starring Maria Aparo, Mieko Gavia and Migina Tsai will be premiering on the big screen at the event. You may recognize these talented actresses from the January 8th Metropolicks Book Release Party. 2) We'll also be raffling off a few printed copies of Metropolicks at the Love Actually Film Screening!